Davooda, thanks for the tip on the tenderloin sandwich at the Grafton Winery. My mother-in-law comes from Grafton, and my husband has family all over the area down there. It's been a few years, but I usually confine my eating to catfish, catfish and more catfish when I am down there -- I'll have to make a detour on our next trip. Grafton has other delights as well. There are a couple more wineries, plus one (can't remember the name) which has an adjacent wine store featuring lots of MO and IL wines. Keep your eye peeled especially for Norton-Chambourcin blends, which have fared *extremely* well in judgings. I've had a couple of these blends from local Southern IL wineries that offer excellent value for money. Also, there's a fish market, Beasley's IIRC, that has several sorts of smoked fish. Delish. Wonderfully funky little town, Grafton, ALWAYS worth a visit! We started our second RV trip of the spring May 8 and planned our route across I-80 in Illinois. We arrived at the Village Grille in Naplate, Illinois near Ottawa just as it was closing at 2 PM. Luck was with us. The cook agreed to stick around and fry up a tenderloin for us. Knowing in advance from online reports they were monster size we asked for two buns for the one sandwich so we could split it. It was thick, juicy and delicious. The Chuckwagon tenderloin was every bit as good as the Midwest variety. Sometimes the farther you get from the Midwest the more the difference in interpretation of the sandwich. I wasn't done in the Washington DC area. My last tenderloin was interestingly right on historic King Street in Alexandria Old Town, Virginia. The place was Murphy's, a Grand Irish Pub. 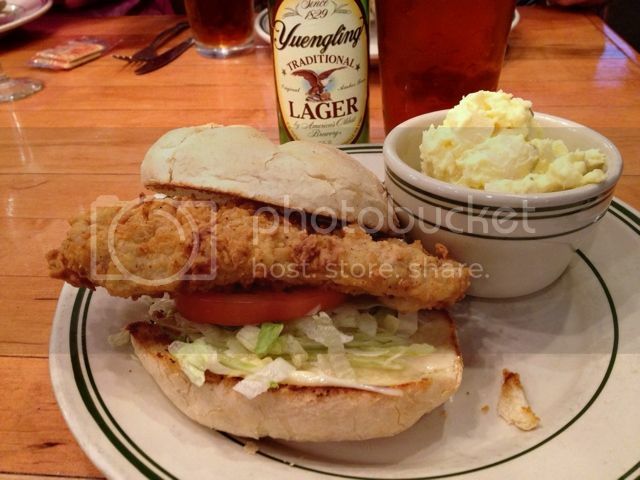 They only serve a breaded pork tenderloin sandwich on the dinner menu starting at 3 PM. So on a casual daytime visit you could miss out. Naturally I delayed lunch until then. It was a fortuitous find I wasn't expecting. I knew ahead of time about the previous place in Nokesville and just happened to decide to check out Murphy's because I had stopped there over 20 years ago. The tenderloin was OK but as you can see it was in the fryer a little too long. After Virginia it was on to West Virginia and then Kentucky. No finds there but I wasn't looking. The serious pursuit started again in Indianapolis. 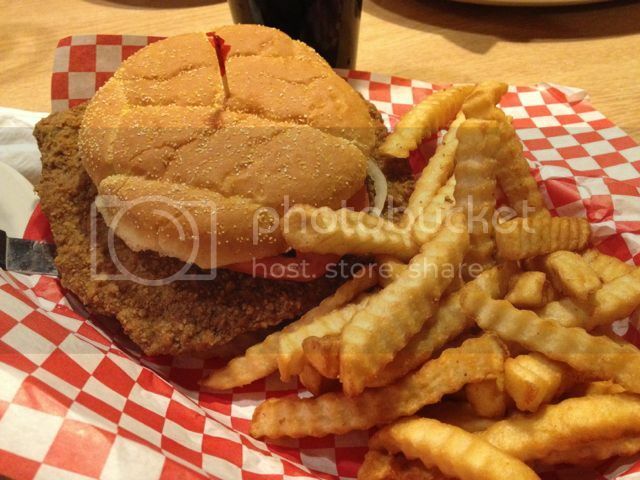 The Stacked Pickle tenderloin in Carmel, IN on Old Meridian Street was our first destination. What you see on top is their special sauce they put on the sandwich during preparation. You can order it without. They also have a with cheese option and a grilled option. This was one of the thicker tenderloin cuts so the sandwich did not exceed the large bun much. Despite the thickness they managed to fry it perfectly. I was in Indianapolis for my annual Indy 500 and high school class reunion. Friday's Carb Day at the Indianapolis Motor Speedway was exciting. I think the new cars looked great. That Indy Lites 100 race was exciting with cars going two abreast through the turns faster than parading NASCAR Sprint cars do on that track. We skipped out after the race and went down to the Workingman's Friend, a local dive bar on Belmont Avenue just north of Washington Street. I hadn't been there for some 50 years back in my underage years buying 6 packs out the back door. It hadn't changed. The coal yard down the street is gone. I think I should have gotten the burger. 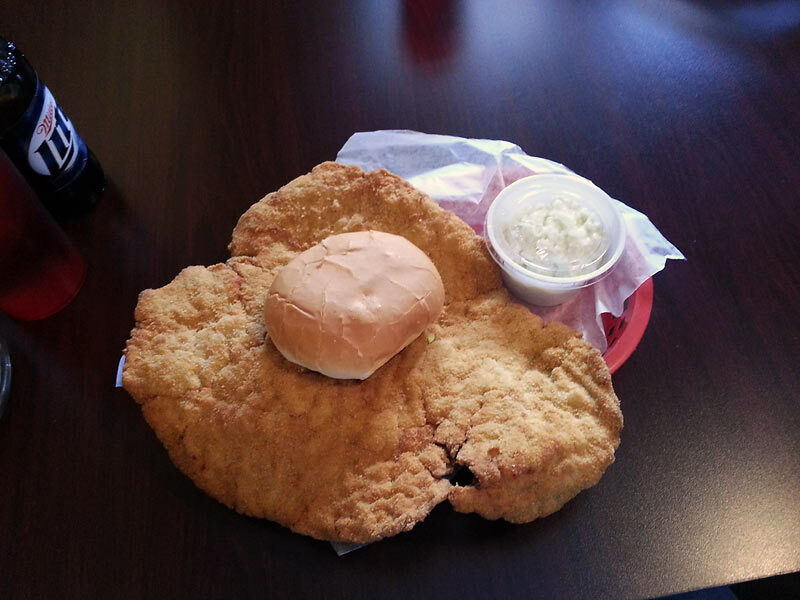 The advertised giant tenderloin was nothing but a fritter just like the Mug 'n Bun in Speedway. Friday night I attended our Speedway HS annual mini class reunion at Grindstone Charley's in Speedway. We have a standing reservation for the back room the Friday night before the race and I believe this might be the 17th consecutive year. This BTW was our 50th year. They always have a tenderloin as a menu choice named after me but this time my other half decided I had exceeded my quota for the day, actually the week for sneaking out to the Workingman's Friend. So I snapped this photo of a classmate's tenderloin. Over the years I've had a lot of tenderloins there so really did not need to sample it. It looked as good as before. The last tenderloin in our Indy stay was at Squealer's Barbeque Restaurant on West 86th Street in Indianapolis Saturday night before the race. My wife, Nurse Cratchet, as one of my classmate friends called her at the reunion was still on a kick monitoring my healthy eating habits. I suggested someone had to order a tenderloin. So, my wife gave up her normal Cobb salad and ordered this one. It was so good she wouldn't share it with me other than an obligatory sample bite. After our stay in Indianapolis we headed north to Michigan's Upper Peninsula in pursuit of the pastie. Great stuff, Davydd! I especially love the Nick's Kitchen part of the story. Here, while it lasts, is a slideshow link from the Indianapolis Star featuring some choice Indiana tenderloins (mostly breaded and sandwiched). Many - but perhaps not all - have been covered here before. I do like how it shows the ubiquity of the tenderloin in the Hoosier State. I finally got the chance to stop in at the oldest restaurant along Route 66 on Sunday as we were driving back from St. Louis. 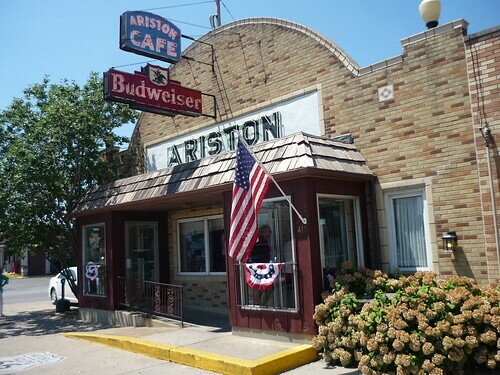 The Ariston Cafe located in Litchfield, Illinois has been up and running since 1924 when it was founded by a Greek immigrant in Carlinville. It gets a few mentions here and there and I was tempted to give them their own thread but read on and you'll see why I'll do that next time around. The Cafe moved to Litchfield in 1929 then into its present location along old Route 66 in 1935. It's been all in the family since day one which means it still is today. My buddy who I was with has been pretty much everywhere down there since he's been making the rounds around the state for years now but he'd never been here so we were both first timers. Along with us there was an eclectic mix of local families there for some after church eating and bikers riding the old road. It seemed to me as if most everyone in there had been at least once. They were doing good business and most people there seemed to be enjoying their weekend brunch buffet which I guess is really popular with the people of Montgomery County. 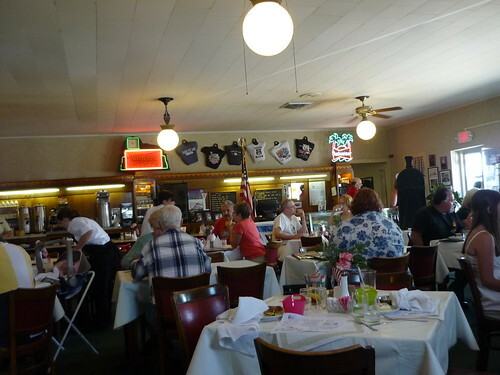 Add that to the fact it is said to be the oldest running restaurant and it's in the Route 66 Hall of Fame and you can see why while lots of other places are long gone Ariston Cafe remains. Ariston doesn't open until 11a so they don't have a breakfast menu. Except for when they do their buffet which was an option and looked/smelled very tempting but I had just spent a couple days pigging out and didnt want a coma inducing breakfast along with AYCE fried chicken and dessert. 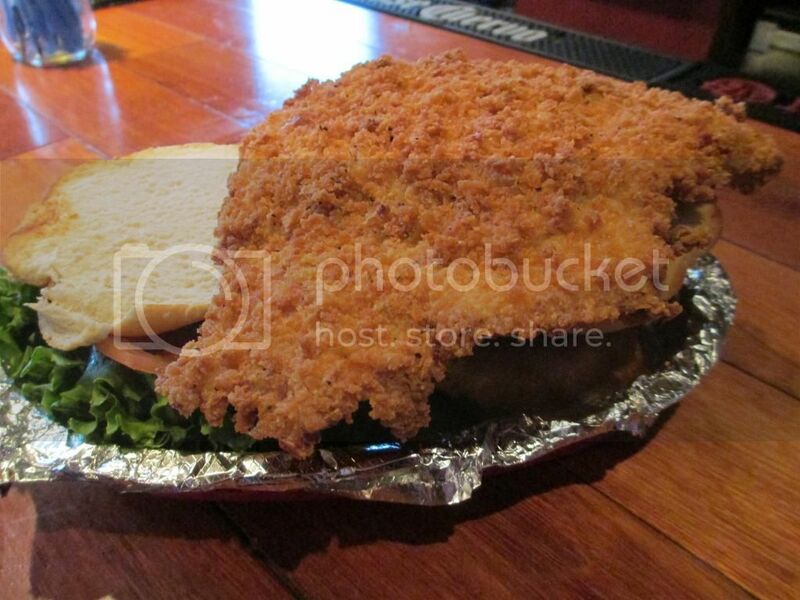 My buddy said he was going to go with the breaded tenderloin and how thats pretty much what he always goes with when he's down in Central Illinois and is eating at a bar or regular old restaurant. He told me it's not just corn dogs, horseshoes and chili that they love down there but tenderloins too are very popular and usually very good. Our waitress confirmed his thought when she rec'd that as her favorite thing there. 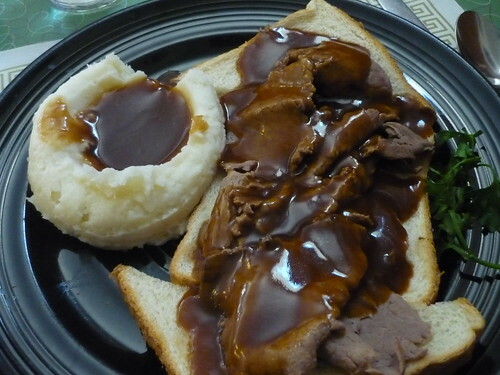 I went with an old diner classic, open faced roast beef sandwich served with real mashed potatoes and real gravy. We split the two in half to share. The roast beef was very good and downright comforting. About everything you could expect. But I left wishing I had just got a breaded tenderloin of my own instead. They had a really nice example. It was definitely hand battered while being perfectly fried and a pleasure to eat the half I was allowed. It was big enough to still go outside the bun but not to the point where you couldn't eat it as a sandwich because of it. The people working this place were all very nice and welcoming and the tenderloin is terrific. I would recommend a stop to anyone passing thru hungry for some non chain food. I look forward to finding out where the other great places with top notch breaded tenderloins are at down in Central Illinois. Happy Cruising. 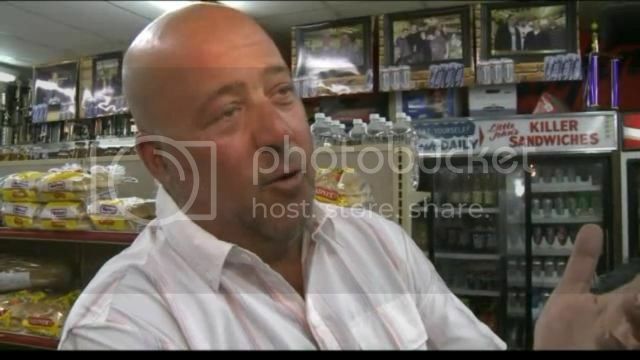 According to Zimmern and the shows producers, BPTs are "bizarre". The show is on cable in 70 countries, some of which may not have BPTs. 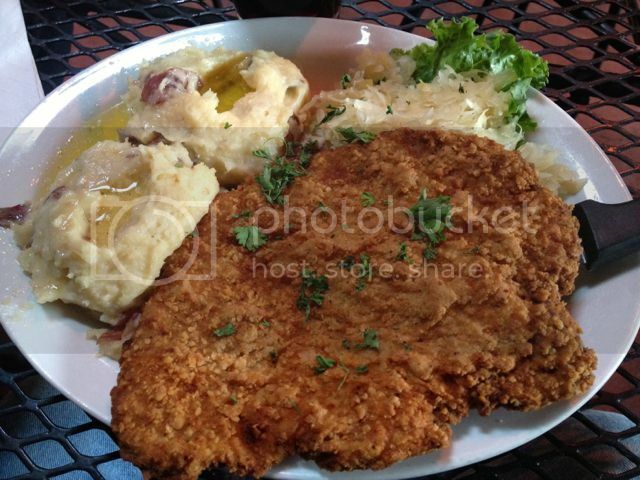 Man, talk about your HUGE pork tender (or pork schnitzel in this case)!! A buddy sent me the reference to Waldgeist, a bar-resto outside Frankfort Germany, where their schnitzel is "XXL". 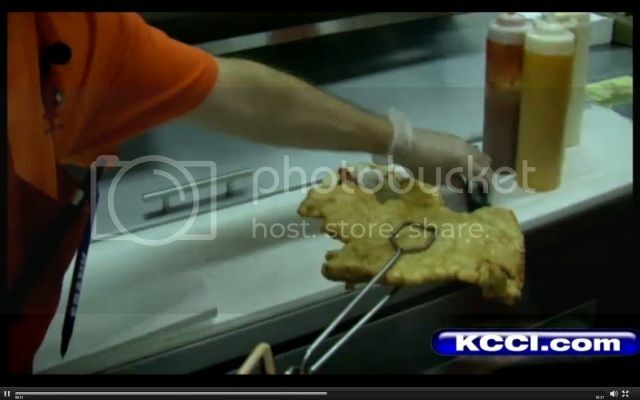 Altho' the video is in German, you'll be able to see the size of the 'breaded pork tender' for yourself. 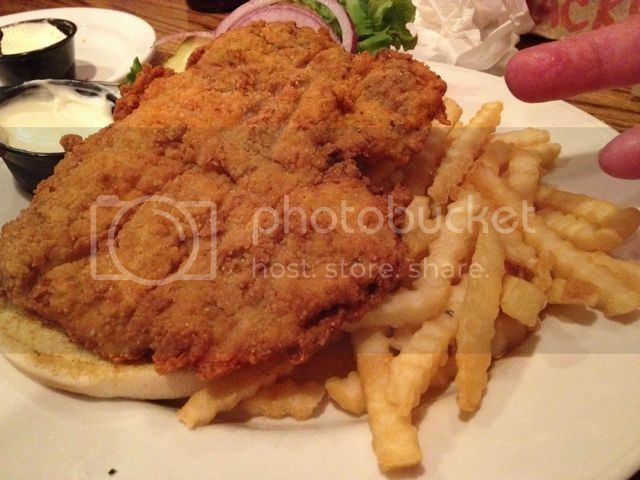 Geo wrote: Man, talk about your HUGE pork tender (or pork schnitzel in this case)!! A buddy sent me the reference to Waldgeist, a bar-resto outside Frankfort Germany, where their schnitzel is "XXL". 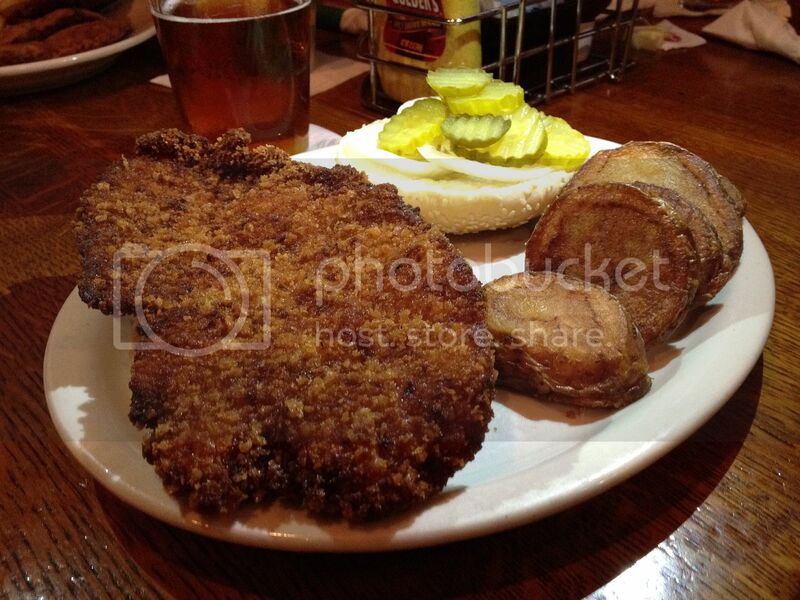 Altho' the video is in German, you'll be able to see the size of the 'breaded pork tender' for yourself. 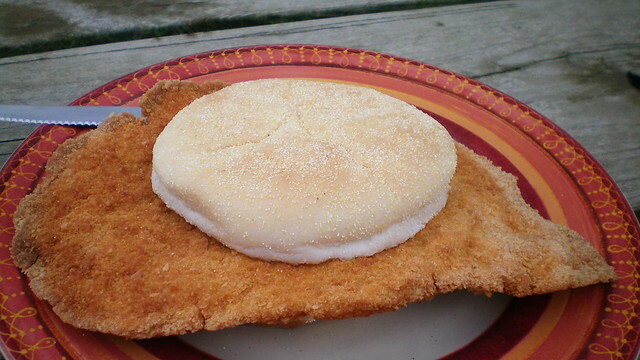 Yeah, there's also a whole chain of restaurants in Hungary called Bécsiszelet (literally, "Wiener Schnitzel"/"Vienna Cut"), which sell breaded meat cutlets flattened to the size of dinner plates, too. Here's a commercial for the visual. I enjoyed many a schnitzel there. The one you linked to seems like it's a bit thicker, though. 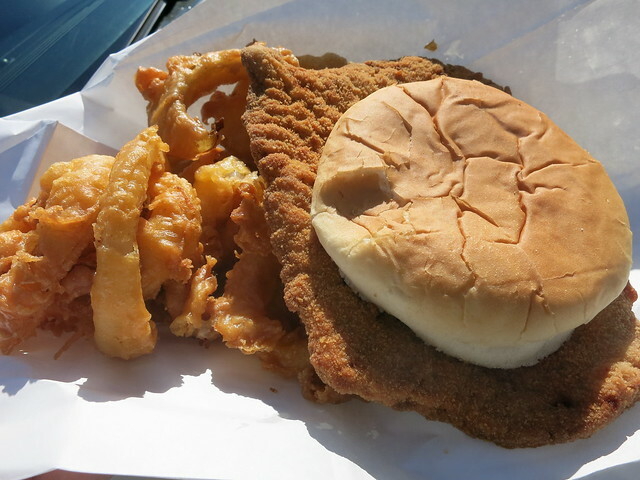 Last Sunday, I enjoyed a solid presentation of the breaded pork tenderloin at the Whistle Stop Restaurant outside Monon, Indiana, a place I'd never heard of and, located as it is on a remote stretch of 421 north of Lafayette, I can see why. The tenderloin was prepared fresh, relatively thick and not pounded out too thin, so very moist and toothsome. 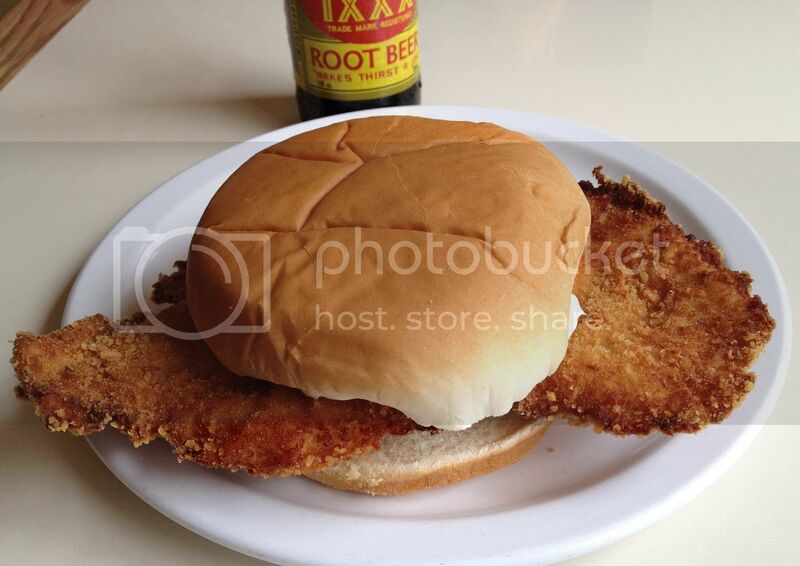 The bun was also above average, a potato roll in kaiser roll form that stood up to the heavy load of breaded pork. The restaurant is noteworthy for the plethora of really high-quality railroad memorabilia (e.g., the ceiling lights are salvage from a now-defunct train station in Chicago, while a veritable rail yard of cabooses, tenders, and signage are arrayed outside), but most notably, they have a model railroad hanging from the ceiling that will blow your mind; two tracks, totaling a (claimed/alleged) quarter mile of steel snaking through the place. For a separate charge, one can tour their railroad museum; we were not in the market, but maybe next time. Better, by the way, than the decent pork tenderloin was the ham steak sandwich ordered by Mrs. JiLS, slathered with swiss cheese, onion, and mayonnaise, this was one of the most surprisingly delicious things I've eaten in some time. A charming, unexpected, and well-run little restaurant with a theme they take very seriously. Here are some links for anyone seeking more info on "the Whistle Stop in Monon, Indiana"
The Ale Emporium in NE Indianapolis offers up an excellent specimen. Always fresh, not overly breaded, you can distinctly taste the good quality pork. As you might guess from the name, great beer selection. I'd suggest pairing the sandwich with a draft Sun King Osiris, brewed downtown. Very well made beer and served from respectfully clean tap lines. If you're blowing through town on the way to somewhere else the location is convenient. less then 5 minutes from I 465 and I 69. 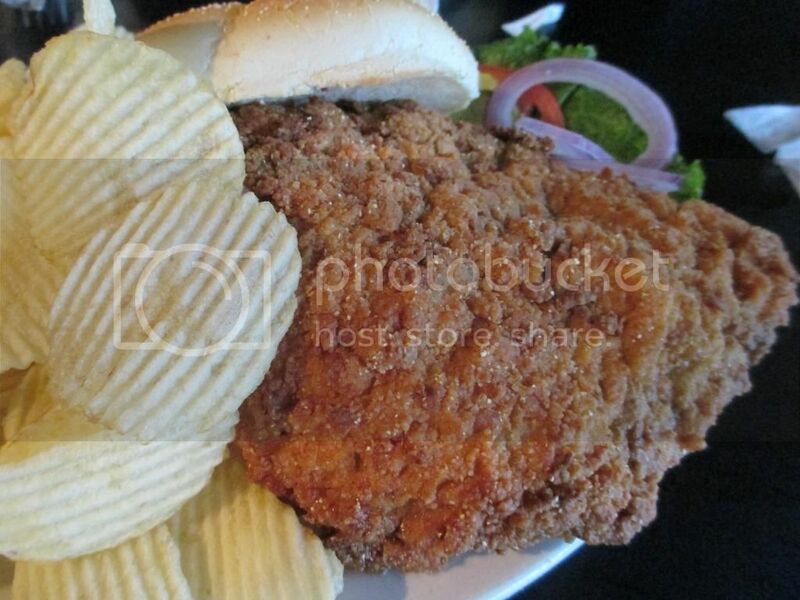 Looking for breaded pork tenderloin locations along I-55 between Chicago and Springfield (other than Culver's). Family day trip in two weeks. 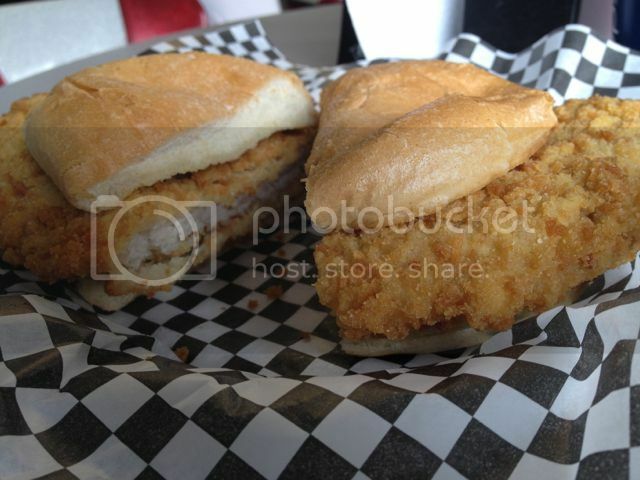 ChristopherSchram wrote: Looking for breaded pork tenderloin locations along I-55 between Chicago and Springfield (other than Culver's). Family day trip in two weeks. 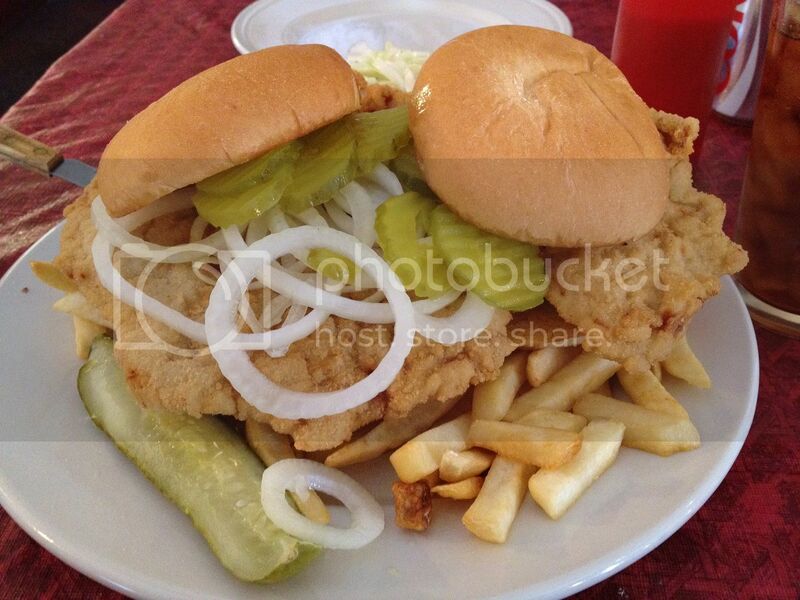 Set your GPS for Lincoln, Illinois for Hallie's for their schnitzel sandwiches aka breaded pork tenderloin sandwich. 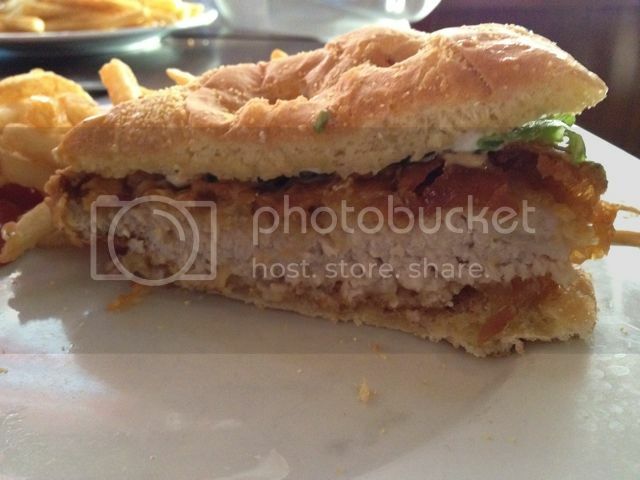 Their chicken salad sandwich is pretty good, too. The last time we were there, it was BYOB. My wife who, having grown up with them, is a bit of a tenderloin fiend, has been raving about this incarnation from Tillie's Icon in Alexandria, IN, ever since she returned from a visit home a couple of weeks ago . . .
We headed south in our RV March 1st and now in hindsight we were fortunate to miss most of the Midwest nasty winter. 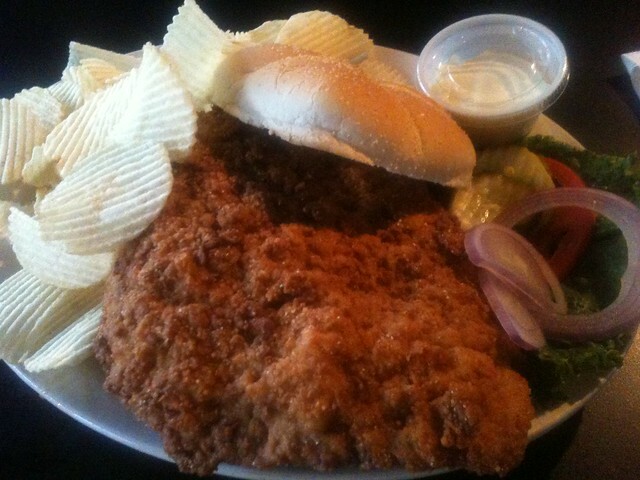 On our way south we did stop at Nick's in Des Moines, Iowa for a luncheon tenderloin. I liked this one much better than the nearby Smitty's in South Des Moines that Iowans seem to like so much. We drove on to Kansas City and for dinner we went to the High Noon Saloon & Brewery in Leavenworth, Kansas. You don't have to get too far out of the Midwest area of Iowa, Illinois, Indiana and Missouri before they start calling the sandwich differently. 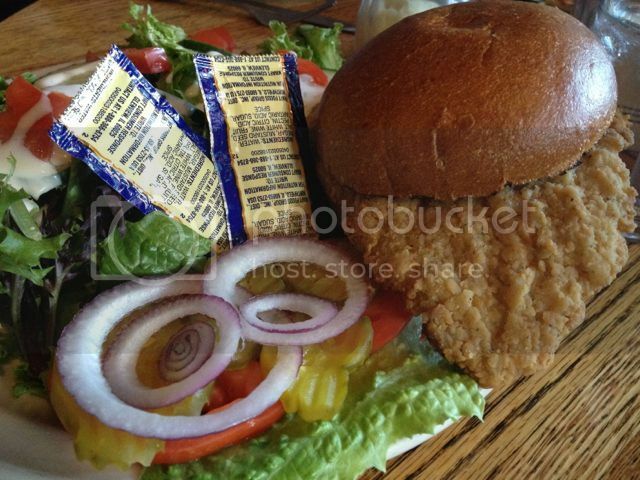 Despite the western themed restaurant, they called this a Schnitzel Sandwich. We made it to South Padre Island for a few days and then followed the Rio Grande River toward Big Bend National Park with a stop in Mission, Texas on the way at the Riverside Club right on the edge of the Rio Grande. There outdoor deck is right on the water and they serve a traditional Midwest tenderloin that was outstanding. We were so close to Mexico I probably could have frisbee tossed this one across the river. I have now had maybe the southernmost tenderloin and the northernmost tenderloin (Rusty's in Palmer, Alaska) and the northernmost lower 48 tenderloin at Trail Center on the Gunflint Trail in Minnesota (10 miles from Canada border). 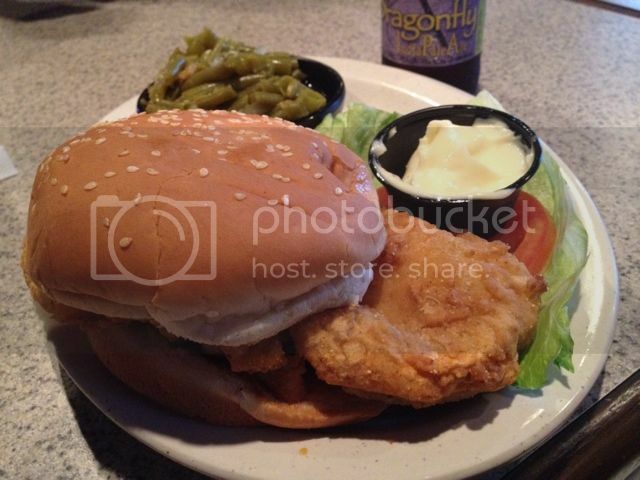 My next tenderloin was at Prejean's in Lafayette (Carencro), Louisiana. 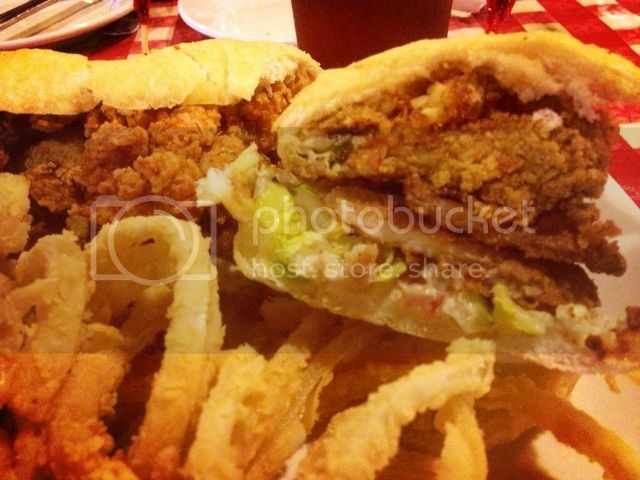 Prejean's is a Cajun/Creole restaurant so this breaded pork tenderloin was Cajun seasoned and served on a Po'boy bun. 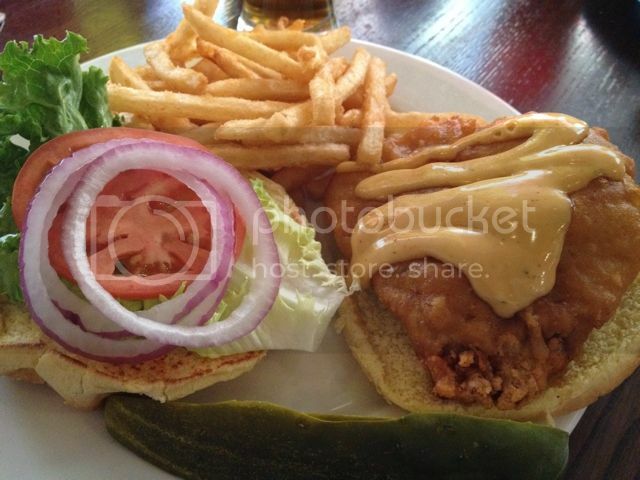 The tenderloin fits the bun, not a Midwestern hangover kind. Also, this one was not on the menu as served. I asked for the addition of fried oysters and fried crawfish tails. There's nothing quite like this anywhere else. Loved it. We went back to South Padre Island and then home to Minnesota but no tenderloin opportunities opened up again on our way, or I should say we were fatigued out on fried food. But then in May it is on to Indiana and the Indy 500 for more opportunities. 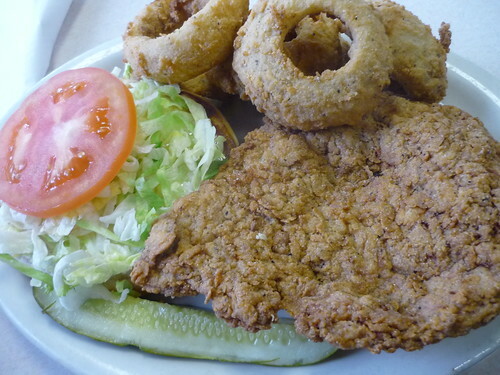 The Iowa Pork Producers Association has selected a southeast Iowa restaurant as the winner of the 2013 Best Breaded Pork Tenderloin Contest. 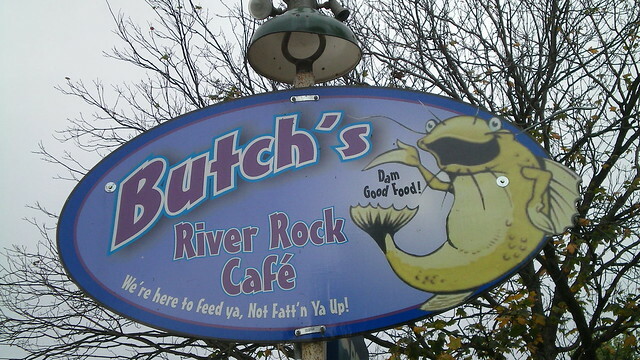 River Rock Café in Mt. Pleasant, Iowa, double coats its hand-pounded pork tenderloins in a cracker and bread crumb mixture daily and serves roughly 500 a week. Need a trip to Iowa soon. I'm now two winners behind. I haven't gotten to last year's winner Breitbach's in Balltown yet. On our recently completed RV trip that took us southwest down to Colorado and Utah and back I found four more breaded pork tenderloins. They are out there. The first was in Niobrara, Nebraska at the Two Rivers Saloon. It was an OK sandwich with no pretense to try to be a huge hangover the bun Midwest variety. Actually, since their dinner menu featured a pork tenderloin entree this sandwich could well have been a true pork tenderloin and not a pork loin cut. Also, I am pretty sure it was pan fried and not deep fried. 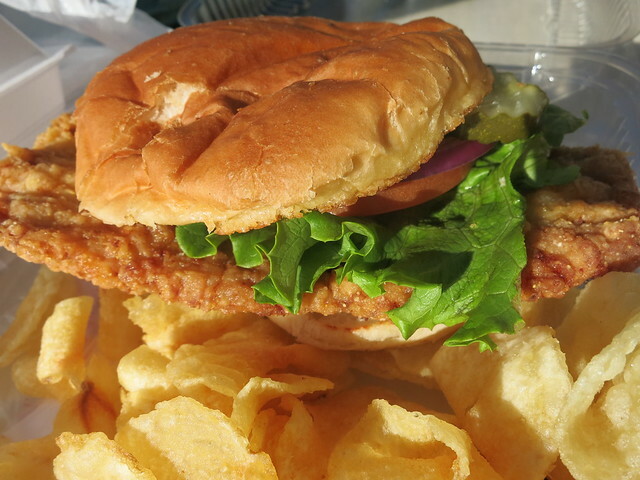 I was hoping to check out if the Flyway Cafe adopted a pork tenderloin sandwich after I convinced them to make them special for our RV group way back in 2008. As it turned out they are no longer in existence. So, my stop in Niobrara did not go in vain with the Two Rivers Saloon. My next stop was in Council Grove, Kansas a straight shot south through the Flint Hills and the meeting place for communications on the Sante Fe Trail. 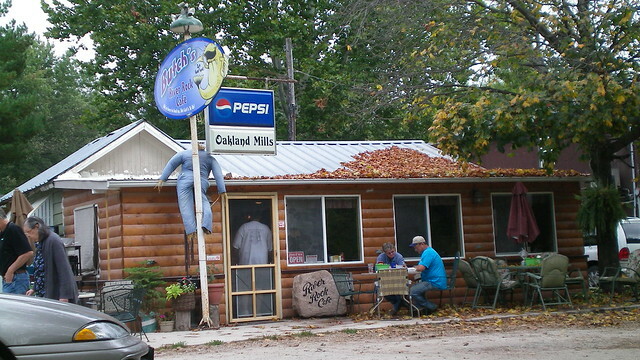 I found a little cafe right on the old trail route called the Saddlerock Cafe. I picked the spot not for the tenderloin but because it was local and right on the trail. 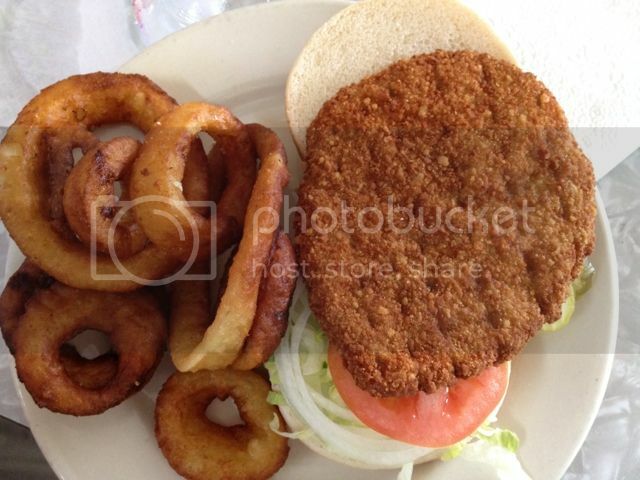 They featured a breaded pork tenderloin sandwich but it was really more a fritter commodity. Hey, but here is the theme. It still counts. Continuing west we stopped to camp right in the little town of Ouray, Colorado. Ouray had a couple of brewpubs of which I spent some time. It was a complete accident that I walked by the Western Hotel's Saloon and saw the menu posted in the window mentioning a pork tenderloin sandwich. I was skeptical. In fact I challenged the waitress and she explained the owner was from Iowa. I said no more was needed to be said and I ordered it. It was actually very good and a pleasant surprise in a very cool little town. My last stop was in Rapid City, South Dakota and totally unplanned. With the government shutdown we were driven out of the Blackhills as nothing was open any longer for camping so we defaulted to a KOA Kampground in the city and decided to try their downtown brewpub, the Firehouse Brewing Co. They had a dinner entree called a Pork Schnitzel with mashed potatoes and sauerkraut. 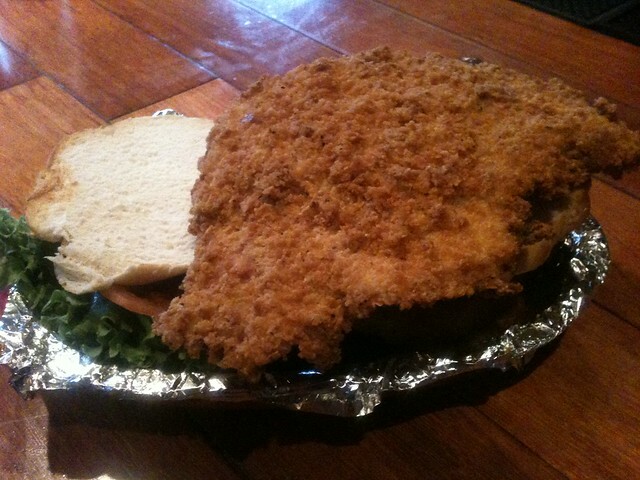 The pork schnitzel turned out to be a very good breaded pork tenderloin representation. The only thing missing was a bun. Put a bun to it and it would have been a topnotch sandwich. So, it counts too, IMO. For a four week trip outside the Midwest I was satisfied in my tenderloin pursuits. It was somewhat luck and persistence. None were pre-planned. I'm still trying to get to Breitbach's in Balltown, last year's winner. Twice now my travel schedule made it possible but those trips turned out to be on the day they are closed. I got a chance to try a few of the tenderloins mentioned when people ask where the best one in Indianapolis is at. I've said before that I found most of the tenderloins I've tried in Indiana to be inferior to those I've tried in Iowa but a couple of these stops have closed that gap. Then again I'm not Davydd or Tyrgyzistan when it comes to them so take my advice with a grain of salt. Something the sandwich on our 1st stop could of used. When we got to the famous Edwards Drive In, it felt like we were in the middle of nowhere rather than a metropolis. This must be the outskirts of town as there were quite a few silos across the street. Edward's and Mug N Bun are like Al's and Mr. Beef, they're the two most well know 'loins in the city. I don't know if the crazy bus was on a field trip but it seemed like every weirdo in the city was inside on my visit. The tenderloin was blah. A thin pre-pounded and most likely pre-breaded patty had both the looks and feel of the ones I saw displayed on Burger King billboards around town advertising their regional offering. 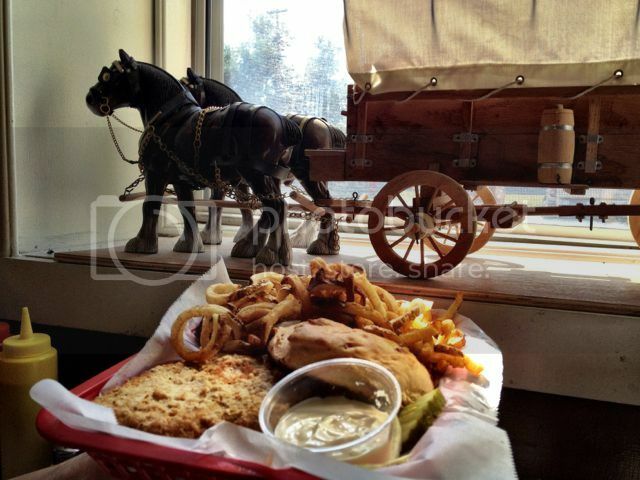 The onion rings were the exact opposite, have an order of those and a root beer and save some room for something else. 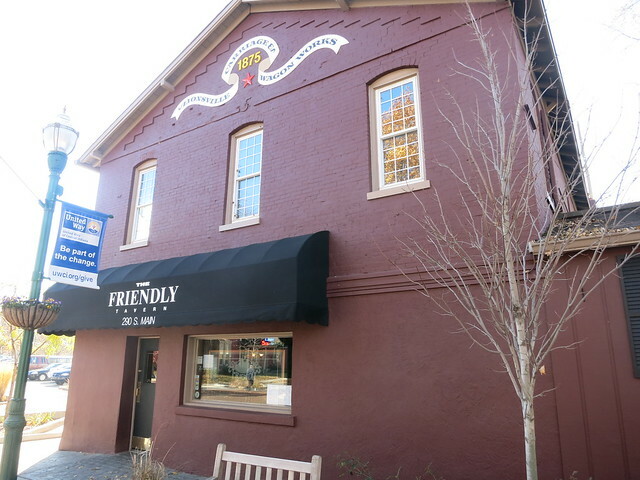 After the trip to Edwards I was about to give up eating tenderloins while in Indiana but the friendly folks at the Friendly Tavern in Zionsville switched that. The tenderloin sandwich here was written up in the Super Sandwich article from which I tried quite a few spots. I went in with high hopes for this one. It was an unusually nice day weather wise that Saturday so it seemed like everyone from town was there. The bartender was quick to take my order and said I wouldn't be disappointed with their product. That I was not. Finally! A tenderloin that isn't beaten like a victim of LAPD. The locally sourced loin makes for a juicy interior while the thin fried coating stuck with it on each bite. It's of my belief all onions served on tenderloins should be red onions. They just work better. Next up is a stop I already wrote up in a dedicated Indy thread but I'll throw them in this round-up for documentation purposes. 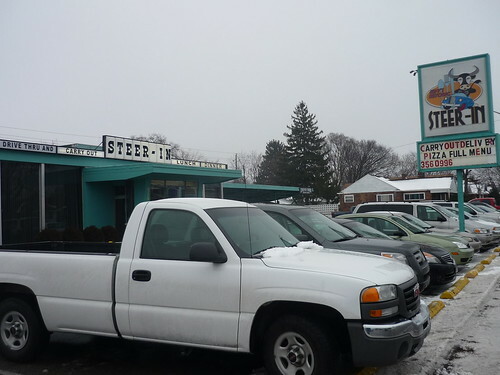 I enjoyed everything I ate at the famous Steer-In including the tenderloin. So far the best tenderloins I've had were relatively small in size compared to most others you find. The next two I stopped into with jimswside when he joined me for a trip one day a couple months back. I actually placed my camera in a cup of water I had in the car so it went bye bye and didn't come back to life until a few days of sitting in rice later. So these are crappy pics taken with my antique iPhone. Both Plump's Last Shot and The Nickel Plate in Fishers are also mentioned when best tenderloin in town is discussed. Plump's is on the 50 something best sandwiches list and a place I had on my radar so we watched some football and had a sandwich there. I really liked the spicing in the coating but as Jim said, this would of been better on a plate with some onions and gravy smothered over it. The sandwich is just too damn big to get a bite of with a little bit of everything in it. Meanwhile after that it was off to the Nickel Plate where it was packed with Steelers fans of all ages and sizes. I guess there's a large contingency of fans down there because we were told it gets like that for every game. They've always been a respected fanbase. So what about Nickel Plates tenderloin? Eh. It was ok. The coating slipped off pretty easily making the thing even harder to eat. I just ended up cutting chunks off and popping them like potato chips between sips of beer. Full report on all non-tenderloin related munchies coming soon to an appropriate thread. 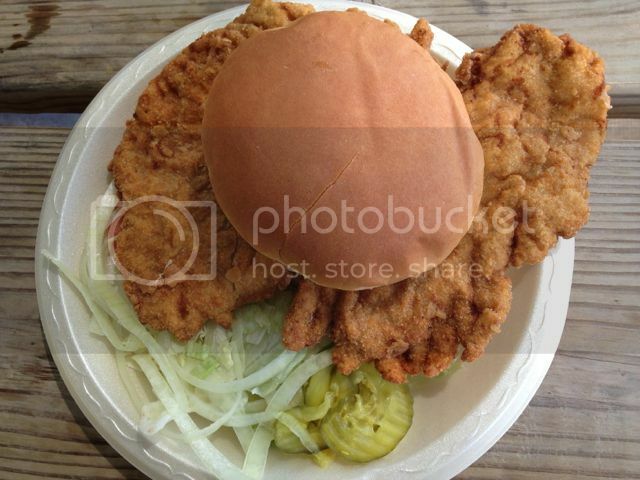 I've been looking at this thread for years as if I wanted to know the best pork tenderloin sandwich out there. Plus I love threads that involve road trips and pictures. Problem is, I've never had one. I don't see why I wouldn't like one, I like just about anything deep fried, so this right up my alley. One day, I'll try one. The Silo in Lake Bluff is about 7 minutes from my house and they claim to have an award winning tenderloin which many of you know about. My friend had it not long ago and didn't like it. I suppose it would have been the right moment to ask for a taste, but I didn't. 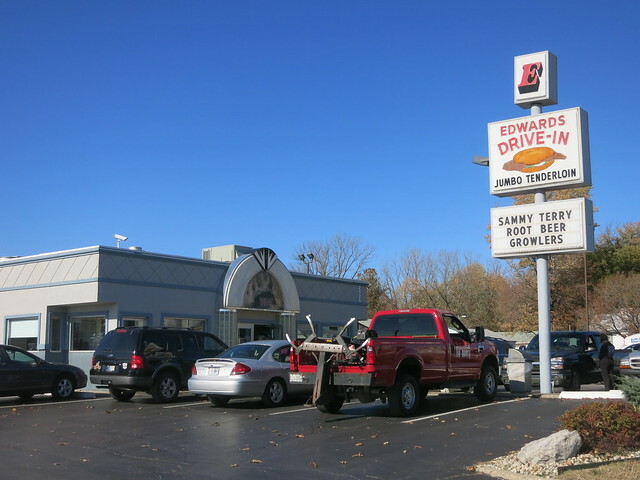 Ram4 wrote: The Silo in Lake Bluff is about 7 minutes from my house and they claim to have an award winning tenderloin which many of you know about. My friend had it not long ago and didn't like it. I suppose it would have been the right moment to ask for a taste, but I didn't. Had it once. So dry, it was nearly a choking hazard. I haven't been to Edwards Drive-in yet but have been to all the others. That food show where the guy pigs out on a challenge put Edwards on the map. I suspect its reputation will last forever just like Mug n' Bun has for over 15 years since they last had a good tenderloin. You were smart not to make Mug n' Bun a stop for a tenderloin. I hate saying that because the Mug n' Bun was my high school haunt and I do have great nostalgic memories. It is hard to rank my favorites in Indianapolis because there are a lot of good ones and you didn't get to them. Even my favorites change with my annual May Indy trips. One thing I learned though is a tenderloin can vary greatly at a restaurant depending on a lot of factors -- the meat, the prep, the oil, the fry cook, etc. Sometimes even how busy they are. I learned that having one every Friday night before the Indy 500 race at Grindstone Charley's on Crawfordsville Rd in Speedway for the past decade at least. Some years average and some years great. thought this was a good tenderloin, was worried by how thick it was when it came out, thought it would be tough, not the case..
Nickel Plates was good as well. I like pork tenderloins, I prefer them served with mashed potatoes and gravy, or perhaps open face(a couple pieces of squishy white bread) still served with mashed and gravy. - Thats how I order mine from Wedron Office(house pounded), and Illini Lounge(Polancic's). Da Beef wrote: I got a chance to try a few of the tenderloins mentioned when people ask where the best one in Indianapolis is at. I've said before that I found most of the tenderloins I've tried in Indiana to be inferior to those I've tried in Iowa but a couple of these stops have closed that gap. Then again I'm not Davydd or Tyrgyzistan when it comes to them so take my advice with a grain of salt. Something the sandwich on our 1st stop could of used. Thanks for the Circle City Tenderloin Roundup. Some I'd been curious about, some I never heard of. I guess this is as good a time as any for me to unload some old reports. For a (maybe too) well-salted tenderloin, try Sisters' Place, on Madison a mile or two south of downtown. Aside from being seriously over-salted (a fluke, I hope), this was one of the better t-loins I've had in Indy. The corn flake coating was nicely crispy but not greasy. I'd definitely give Sisters' another try, maybe even for chicken-n-dumplings and sugar cream pie. Da Beef wrote: Edward's and Mug N Bun are like Al's and Mr. Beef, they're the two most well know 'loins in the city. 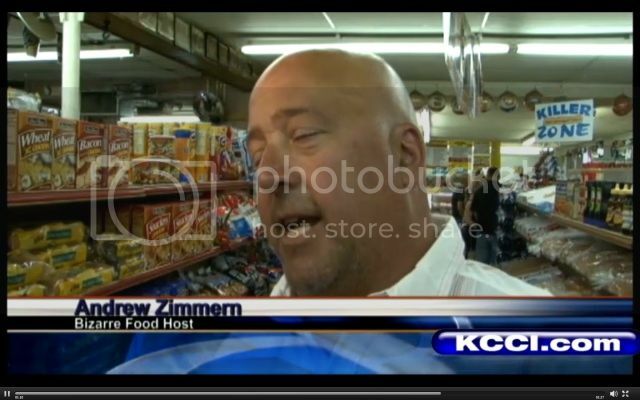 … The tenderloin was blah. A thin pre-pounded and most likely pre-breaded patty had both the looks and feel of the ones I saw displayed on Burger King billboards around town advertising their regional offering. Davydd wrote: I haven't been to Edwards Drive-in yet but have been to all the others. That food show where the guy pigs out on a challenge put Edwards on the map. I suspect its reputation will last forever just like Mug n' Bun has for over 15 years since they last had a good tenderloin. You were smart not to make Mug n' Bun a stop for a tenderloin. I hate saying that because the Mug n' Bun was my high school haunt and I do have great nostalgic memories. 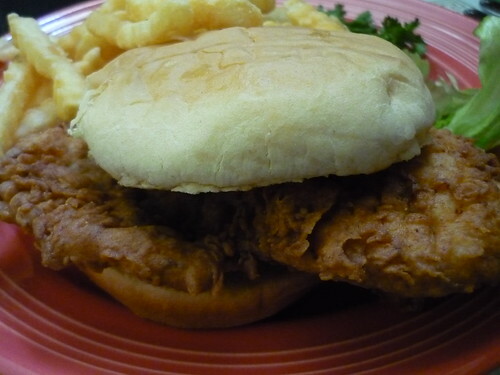 Yeah, Mug n' Bun always seems to come up in discussions of Indy's best tenderloin. You really have to wonder about those who recommend it—have they not been there in decades or do they have Naugahyde palates? The suspiciously round patty is filled with air bubbles—in other words it ain't real meat. Given what they have to start with, I'd have to say they do a respectable job preparing it. A cool old drive-in that's still worth a visit, but not for a tenderloin. Mann's Griile is a classic greasy spoon, reminiscent of some decades-ago Uptown diners, long before the word gentrification was ever spoken in those parts. The place was packed with a loud crowd, the griddles were overflowing with meat and grease, tempers were short, and the air was so hot and greasy it was hard to breathe. Got one to go. Another pre-fab patty, notable mainly for its low price. I may as well briefly mention a couple other pretty good places I posted about before, even though it was long ago. 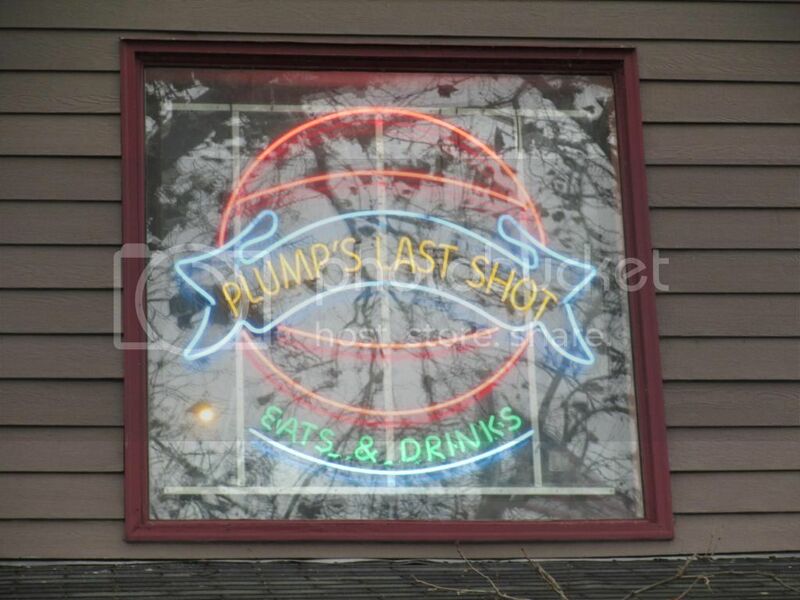 Plump's Last Shot is one of the few sports bars I find tolerable, and only partly because they serve good food. I found this sandwich admirable in almost every way (though admittedly it verges on overly large). John's Stew serves another that's too big for its own good. However, they offer a clever solution to the overhang problem. Hoosier tenderloin humor at its best. Finally, one not so close to Indianapolis. 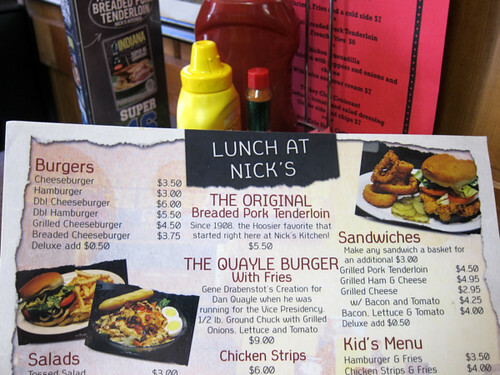 I had high hopes for Nick's in Huntington (25 miles southwest of Fort Wayne; mentioned above), a diner that's been serving tenderloins a long time. The 'loin looks good but it had almost certainly been cooked well in advance (it arrived suspiciously quickly during an afternoon lull and was appallingly stiff and dry). I'm a fan of rhubarb pie but have to say that was probably the worst slice I've had. The bitter, pasty filling was inedible. That day last May, I got the distinct feeling the kitchen was simply going through the motions. Rene G wrote: Finally, one not so close to Indianapolis. 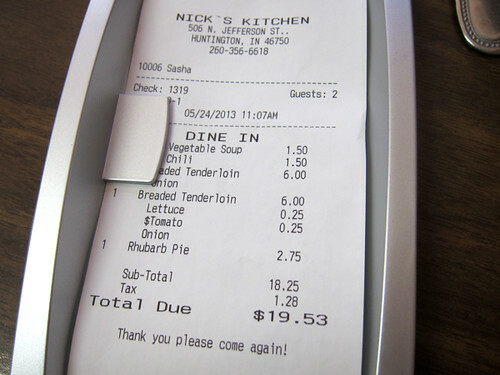 I had high hopes for Nick's in Huntington (25 miles southwest of Fort Wayne; mentioned above), a diner that's been serving tenderloins a long time. 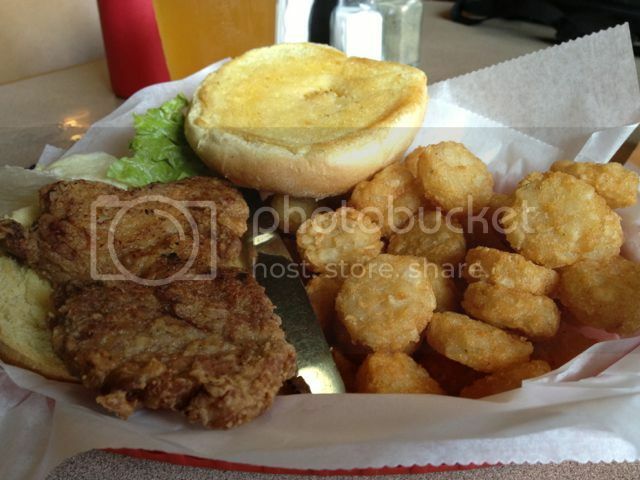 Isn't Nick's the place that claims to have invented the breaded pork tenderloin sandwich? Either way, a completely unmemorable Frisbee from what I remember. Antiseptic decor to boot. Besides making that bold claim on their menu ("The Original"), they also decided to upcharge us 50 cents ($5.50 on the menu, $6 on the check).